BsnTech Networks received a referral from Don, the owner of Play Like a Champion Today. He referred over Martin, the owner of MK Knowledge Builders. Martin had been looking for a way to get his website converted over from Joomla to WordPress. Martin was familiar with updating his website through Joomla, so he wanted to be sure it would be just as simple (or easier) with the conversion of the website. The main concern Martin had with Joomla was the security updates. With each major revision of Joomla, it requires a full re-working of the website. And in some cases, the plugins/components used are not available in the newer version. We started by doing the base install of WordPress and then getting the design of his website to be very similar to his current Joomla site. Then, we imported all of his pages and blog posts, got the features added, and we were finished. Martin has been successful with already putting a few blog posts on his website and has taken the transition very well already. We appreciate the continued referrals from our customers and the additional opportunity to help Martin! The website for MK Knowledge Builders is mkknowledgebuilders.com. One of our long-time customers has been very pleased with our services. They operate a computer repair shop and sometimes have customers ask them about website design services. In the case of T & W Farm Equipment, they were one such customer that was referred to us. T & W Farm sells new and used farm equipment and they are located in Tennessee. They were requesting to have a website created that contained their product catalog – but not the ability to actually purchase the items on their website. BsnTech Networks delivered with a website that does just that; it is a product catalog website. Patricia, one of the owners of T & W Farm, will be managing the website and updating the catalog as needed. BsnTech provides easy-to-follow video tutorials for our customers. This empowers them to be able to make the changes and manage the site themselves – therefore saving considerable cost with us doing any updates for them. We appreciate the referrals from our customers and it certainly shows that BsnTech Networks strives to exceed our customer’s expectations and provide them constant and fast service when needed. The website for T & W Farm Equipment is twfarm.net. Paul, a current customer of BsnTech, contacted us this week to have us vectorize a logo for another business, Perpetual Value. Paul sent us over a Word file with the logo in it. They needed to have a vector file in EPS, PDF, and AI file formats – plus a DST format so it could be used at embroidery shops. Our logo designer was able to get this task completed in less than 24 hours and was approved by Paul. We appreciate the continued business we receive from Paul and his group! Tom, the owner of FloorTech, LLC – contacted us a few months back to have a website created. Tom is part of a franchise program for a service company that provides non-slip floor solutions for large companies. Especially in the business sectors that cater to customers, wet floors cause customer liabilities with slipping and falling. Therefore, Tom wanted to get into the business of providing a floor solution that can be applied to floors to increase friction and help reduce slips, falls, and lawsuits. We got to work on Tom’s website as soon as he sent over the initial information that he wanted on the site. Through some coaching and consulting, we geared Tom to providing us some better quality material for the site to make it on-point and to focus on three primary targets for his home page. During this time, our graphic designer also completed a logo as well. Today, Tom made a few final changes to the website – and we have launched his website for business! We appreciate Tom’s business and persistence with getting us the text content for his website. The site for FloorTech, LLC is nonslipfloorsolutions.net. Richard contacted BsnTech a couple of months ago asking about website design. He took some time to think about the website some more – and then contacted us a few weeks ago ready to get started on his site. 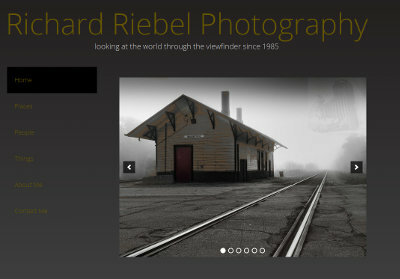 Richard wanted a minmalistic website so he could post his photography in an easy-to-navigate fashion. He also needed the ability to allow him to have password protected galleries that he could share with his clients – so only they would have access to the galleries. We put together a picture gallery, a home page slideshow, and a basic contact form on the site. Today, we have finished up with the site and turned it over to Richard to populate with his pictures. We appreciate the business from Richard and look forward to supporting him for as long as he has his website! Jeff, the owner of Emerald Coast Construction, has been a long time customer of BsnTech Networks – since early 2012. Jeff contacted us late last week and said that his website with GoDaddy had been compromised. Unfortunately, someone found out what his password was and completely deleted his entire website that we made for him several years ago and put up hundreds of pages of advertisements instead. Because of that, all of the work we previously did was lost. However, BsnTech Networks was able to find another solution and managed to find a backup/copy of his website! Jeff opted to go ahead and have us manage his website hosting and his two domain names moving forward. While we are a bit more expensive than GoDaddy, we provide automatic rolling seven day backups on hosting accounts and also provide mirrored/redundant web hosting. If there were backups of the website in place, Jeff would not have had the expense of re-creating the website. We then re-made the website using the same information and pictures on the previous site. However, the website did receive a facelift as well. Jeff sent a few extra pictures to include in the website – and then it was completed! We appreciate the continued business from Jeff. 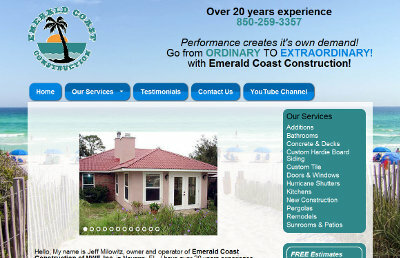 The Emerald Coast Construction website is at emeraldcoastconstruction.com. 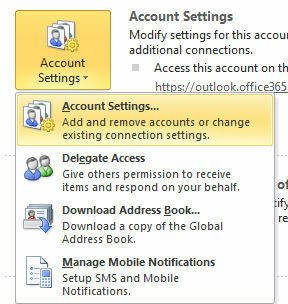 If you would like to use Microsoft Outlook to connect to your e-mail account, follow the instructions below. This article was written using Outlook 2010. 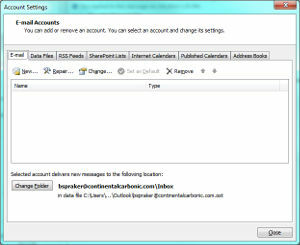 The setup using other versions of Outlook should be very similar. Step 1 – Open Microsoft Outlook. If this is the first time you have opened it, it will greet you with setting up an account. Skip to Step #5. 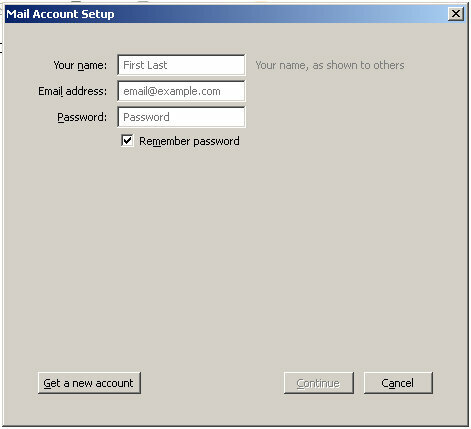 Step 3 – An “E-Mail Accounts” dialog box appears. Now click the “New…” button. 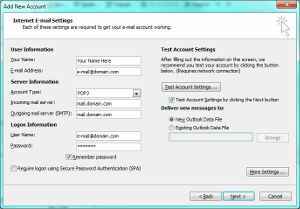 Step 4 – Ensure that “E-Mail Account” is selected on the next screen and then choose Next. 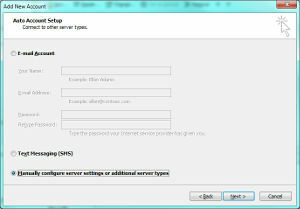 Step 5 – Choose “Manually configure server settings or additional server types” and then hit Next. 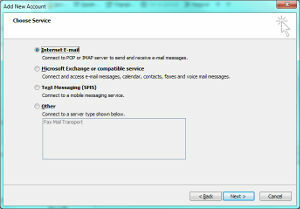 Step 6 – Choose “Internet E-mail” and then hit Next. 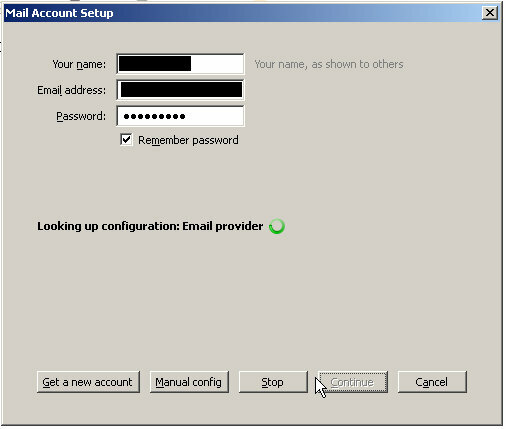 Step 7 – Now, fill in the information to configure the account. Enter your name and e-mail address. Ensure the Account Type is POP3. The incoming and outgoing mail server should be set to mail.<yourdomain> where <yourdomain> is your domain name. As an example, if your domain name is “products.com”, you will enter “mail.products.com”. In the User Name box, ensure you enter your FULL e-mail address. Step 8 – Now, click the “More Settings…” button at the bottom right side and then click the “Outgoing Server” tab. 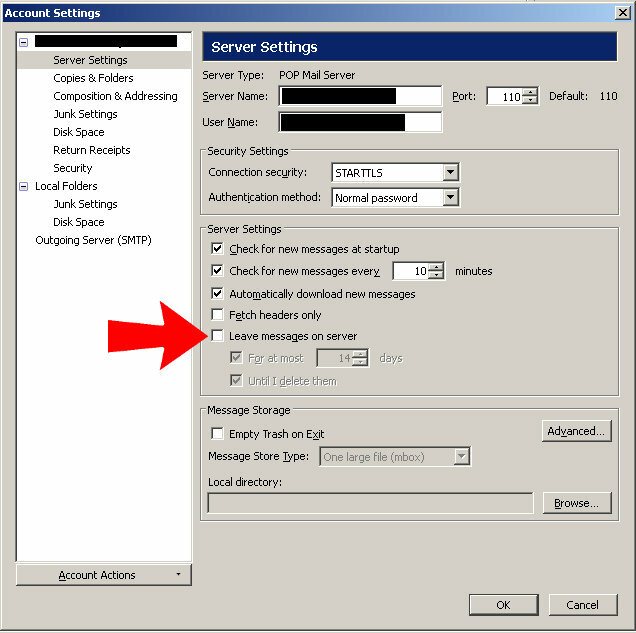 Step 9 – Click the “My outgoing server (SMTP) requires authentication and ensure the “Use same settings as my incoming mail server” is selected. 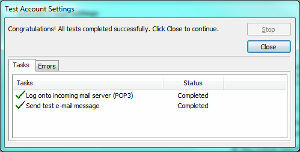 Ensure the Incoming server (POP3) port is set to 995. 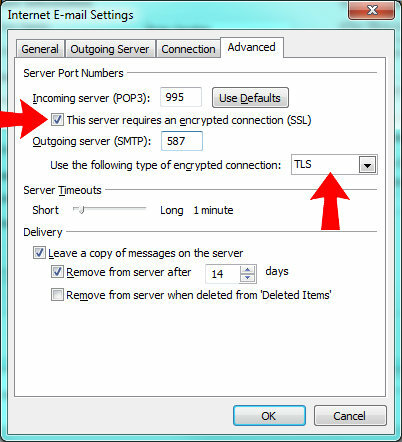 The Outgoing Server (SMTP) port should be set to either 587 (some Internet providers block the standard port 25). 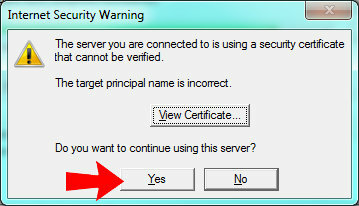 Check the option that says “This server requires an encrypted connection (SSL)”. Then click the “OK” button. Step 11 – This will return you back to the page that has your name, e-mail address, and other information. Click the “Next” button. 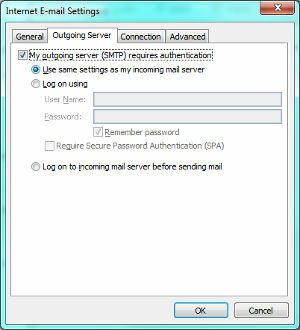 Outlook will then attempt to connect and ensure that it can reach the mail server and ensure the settings are correct. 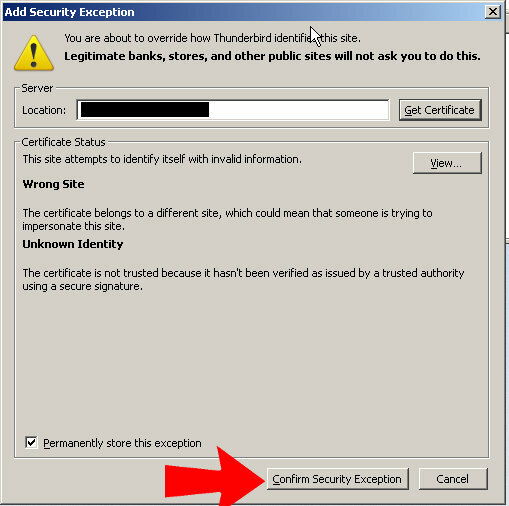 Step 12 – Upon checking your e-mail for the first time, you will receive a pop-up box noting that a security certificate is being used that cannot be verified (as shown below). This is because BsnTech Networks uses a shared SSL security certificate for all customers. Simply hit the “Yes” button to continue. 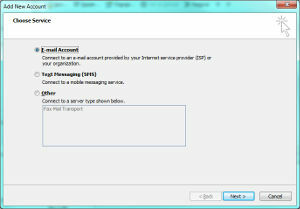 These instructions will help you configure Mozilla Thunderbird with your e-mail account provided through BsnTech Networks – a free e-mail program. #2 – It will prompt for name, e-mail address, and password. Enter the information in. Then hit continue and then Manual config immediately afterwards. 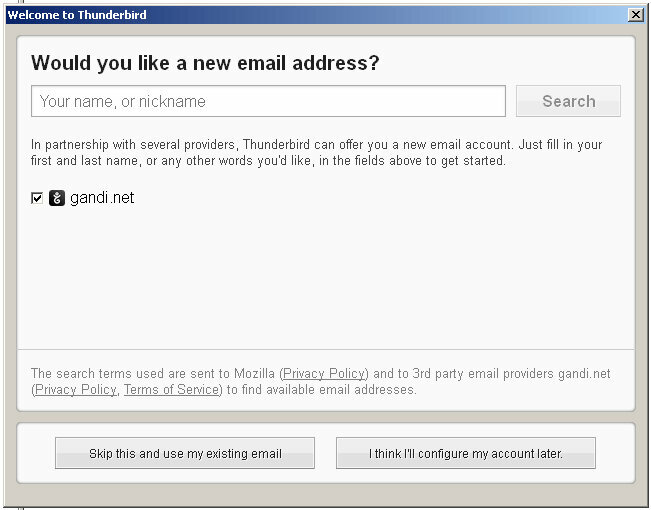 #4 – Enter the settings to manually configure Thunderbird. Incoming should be set to POP3 (as noted above). Server name is your domain name (where it says “your-domain-here”) needs to be your domain name. Port is 110, SSL is STARTTLS, and Authentication is Normal Password. Username is your full e-mail address. This is important, it must be your full e-mail address. #6 – Now, click the “OK” button and Thunderbird should be setup. If at any time you receive a security notice (like the one below), click to “Confirm Security Exception”. 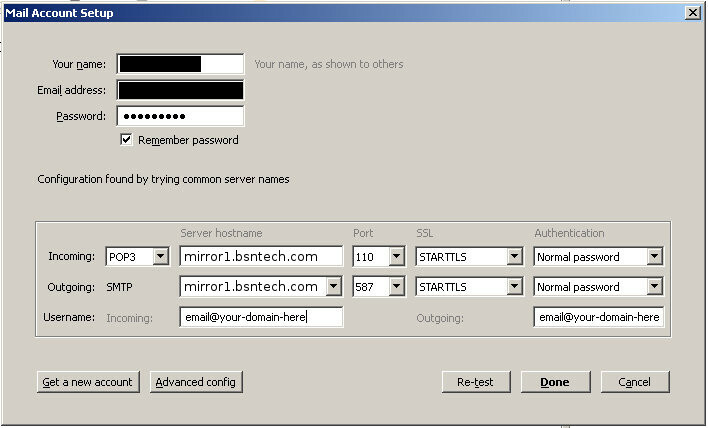 BsnTech Networks uses a shared SSL certificate to secure e-mail communications. 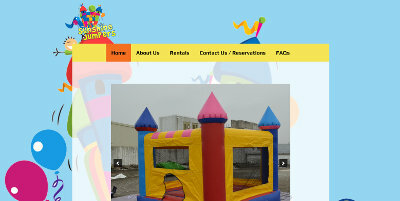 Michael, one of the owners of Sunshine Jumpers out of Port Orange, FL, contacted us a few months ago asking about website and logo design service. His first requirement was getting his logo done – which our logo designer completed a few months back. A few days ago, Michael contacted us and said he was ready to get started on the website and provided us the information we needed to get started. Over the course of the past three days, he sent us material and a few requested updates/changes. This morning, he has approved of the website and was ready for it to go live! We appreciate the business from Michael and look forward to working with him as his business grows. The website for Sunshine Jumpers is at sunshinejumpers.com. 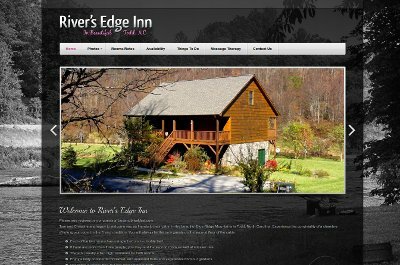 Tom, one of the owners of River’s Edge Inn, contacted us yesterday asking about website hosting and our costs. Tom has used BsnTech a few times for website updates to his site, and he has received exceptional service and rates from us for the updates received. He received his invoice for the next year of web hosting from his previous provider and asked us how we compare. While our cost was the same as his previous provider, we also offer to manage a domain name at no extra cost. Therefore, his yearly savings will be about $17 per year versus what he paid prior with having to pay for his domain name separately. Tom asked us to go ahead and proceed with the transition. Prior to Tom paying the invoice, we already took a full backup of the website in preparation. Upon him paying the invoice, we put the website on our servers, got the domain name transferred, and completed the entire process – in less than one hour! We appreciate the continued business from Tom and hope that he will continue to see value in the services we provide him. The River’s Edge Inn website is at bnbriversedge.com. Want to get an estimate or have questions about our services? Get in touch with us!